Why do people still believe the Conservatives are more likely to raise their living standards than Labour, even though they understand that they have become worse off over the last five years? Why do political commentators brand Ed Miliband a “useless” leader, when even former Torygraph stalwart Peter Oborne has admitted he has been responsible for extraordinary successes and has challenged the underlying structures which govern Westminster conduct? Let’s look at the first claim, courtesy of the latest Mainly Macro article by Professor Simon Wren-Lewis. He makes it clear from the start that people are being denied the facts; otherwise the economy would be the Conservative Party’s weakest point in the election campaign. He continues: “There is no factual basis for the view that the Conservatives are better at managing the economy, and plenty to suggest the opposite. However this belief is not too hard to explain. The Labour government ended with the Great Recession which in turn produced a huge increase in the government’s budget deficit. With the help of mediamacro, that has become ‘a mess’ that Labour are responsible for and which the Conservatives have had to clean up. It’s a myth; the facts disprove it easily – so the Tories avoid the facts at all costs. But why be concerned, if Ed Miliband is such an awful excuse for a Labour Party leader. Didn’t David Cameron describe him as “weak” and “spineless” to Scottish Conservatives only a fortnight ago? Not according to Peter Oborne. Writing in The Spectator, he has praised Miliband because he “has been his own person, forged his own course and actually been consistent”. Oborne praises Miliband for “four brave interventions, each one taking on powerful establishment interests: the Murdoch newspaper empire, the corporate elite, the foreign policy establishment and pro-Israel lobby… There is no doubting Mr Miliband’s integrity or his courage. It’s the politics the Conservative Party wants. Professor Wren-Lewis notes that Miliband’s opinion poll ratings are low “because most people just see unglamorous pictures of him and note that he does not have that Blair appeal. He goes on to say that Cameron’s refusal to debate one-on-one with Miliband is “a key test” for the media, with Cameron counting on them letting his spin doctors dictate what people are allowed to see. If that is true, then it seems Cameron has miscalculated. Broadcasters have said the three TV general election debates planned for April will go ahead, despite Cameron saying he will take part in only one. “It means Mr Cameron – who has rejected a head-to-head debate with Ed Miliband – could be ’empty-chaired’,” according to the BBC. 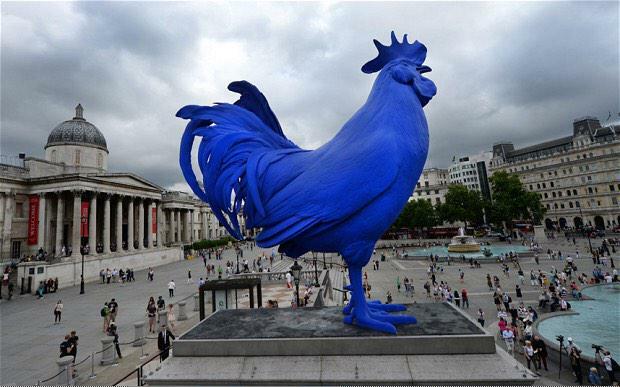 Perhaps they really will put a blue chicken on the podium, as was suggested on this blog yesterday! John Prescott has suggested that if David Cameron does not turn up for the TV debates, this should be placed on the empty podium. Perhaps the broadcasters were provoked by Cameron’s claim that they were the ones responsible for what he called the “chaos” surrounding the TV debates, when it is clear that he has been responsible for delays and indecision. The end result is the same. Cameron has denied himself the chance to stand up and defend his record against an Opposition leader who is increasingly starting to come through as The Better Man. Will the debates be enough to change the mind of the general public and mitigate against the mass ignorance nurtured by the Tory Press? That will be up to Mr Miliband. If his performances in recent Prime Minister’s Questions are any indication, it should be a walkover for him. revealing the facts that some would like to hide. If Miliband and the Labour front bench had spent more effort combatting the Tory /media myth that “they created the mess”, then the leaders debate wouldn’t be so crucial, Labour could be ahead enough for it not to matter wether Ed looks good eating a sandwhich or not. Labour missed the boat… (many boats actually), they nearly missed the Bedroom tax boat until quite late in the Parliament and that was a no brainer! We also have to look at the “real choice” Labour are offering, it’s not radical, it’s a pumped up version of what the Lib Dems are offering. Why would anyone get exited about that? Austerity lite? With inadequate attempts to make the rich pay for their crisis, to pay for the crucial investment in our NHS and Social services etc. Why should Labour EXPECT the working class to flock around them again, to woop and cheer from the rafters! Of course I’ll vote Labour for now, to get rid of the Tories but I wouldn’t actually blame anyone for not bothering, sad as it would be. How do you know that Labour haven’t spent a lot of effort fighting that “mess” myth? You’re looking at everything through the distorting-glass of the Tory-owned media, remember? Labour opposed the Bedroom Tax from the start. I’m surprised people are still pushing the claim that the party didn’t. Read this. The rest of your comment is your opinion, to which you are, of course, entitled. Great article thank you, I have shared…. Because an awful lot of people are actually quite thick and believe anything that is on the BBC news, as well as other broadcasting corporations. They believe everything that they see and hear on tv and read in their grubby newspapers. Because most people haven’t got the nous to listen and question anything and everything – but they haven’t got the brains that they where born with! Unfortunately people are ignorant and selfish. Speaking to an unemployed aquaintance aged 61 I was apalled by her outlook on others in the same situation. Despite being forced to sign on every day, even though she has had a few interviews for jobs, she only has anger towards other unemployed people especially her neighbours who have children. Rather than blaming this government for her predicament, her constant harassment from the nonjobcentre, having her pension age increased (she would have been retired by now) and the lack of jobs generally she ranted to me about her unemployed single mother neighbour and those shown on such programmes as Benefits Street who apparently despite being lazy and workshy get lots of money and no harrassment from the DWP. When I enquired as to her possible voting in the election she replied that she disliked Ed Balls and couldn’t therefore vote Labour so would probably not bother. I’m lost for words !!! Miliband just isn’t very inspiring and he doesn’t appear to believe in anything – that’s just him personally, the party itself hasn’t done enough to distance themselves from New Labour, their economics are New Labour, i.e. neoliberal with a few crumbs tossed to the left wing, when you watch the MPs on Question Time etc they seem desperate to appear reasonable and trustworthy but they do it by mostly agreeing with the Tories. Anyone who saw that plum Tristram Hunt on QT with Michael Gove will know exactly what I’m talking about, Hunt was a disgrace to the Labour Party’s already tarnished name and there have been many others. In fact, part from Yvette Cooper (proper New Labourite, ironically), who gives as good as she gets and would be a decent PM if she wasn’t so right wing, every other shadow minister is just wet and insipid which is also exactly how Miliband comes across. They have no commanding presence, no force of personality so no matter what policies they have or how good those policies are. Miliband and the rest cannot drive them home. In that respect he is the anti-Blair – Blair could talk a good fight without saying anything substantial. Miliband just isn’t convincing because he seems more suited to being a deputy manager of a branch of WH Smiths than running the country. He’s also one of the new breed of bland, interchangeable professional politicians that are such a turn off, post Blair. Let’s face it, nobody would follow him into battle. 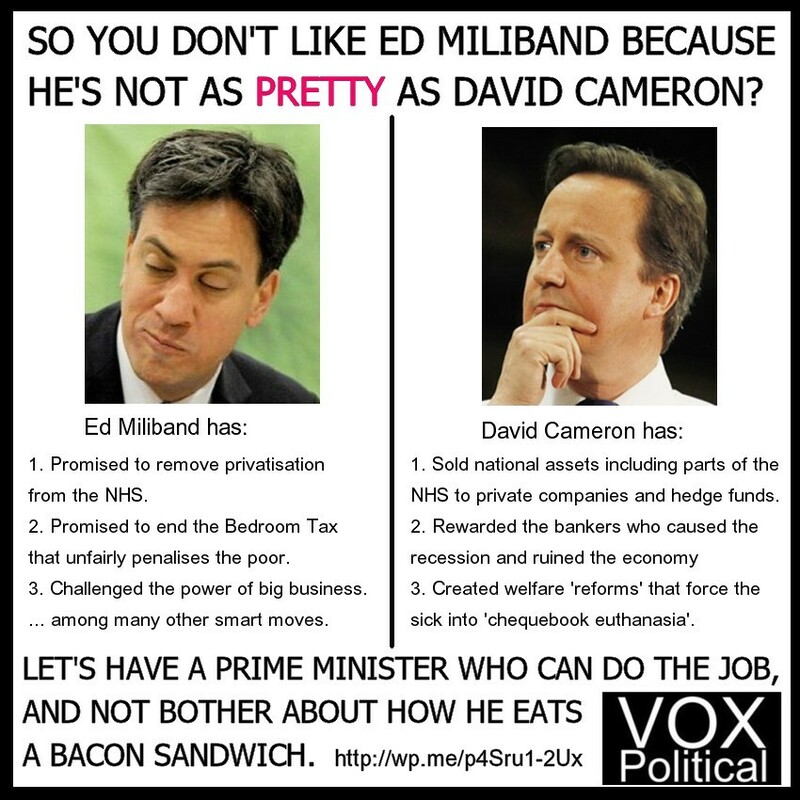 And if he was half way good he’d be mopping the floor with Cameron. Labour – and the country – need a Mark Serwotka or someone like the late Bob Crow; personality, character, conviction. Neil Kinnock, even, would have smeared Cameron all over the walls of the House. The thing with people mistakenly assuming the Conservatives are goos with the economy comes from somewhere else, I think. They have persistently slagged off Labour’s record til the lies have stuck (and it couldn’t have been done without our ‘free’ press) so Labour will always be on the back foot, especially since they’re being so supine in not countering the claims.But… there’s also that thing that people mistakenly believe – if they work hard enough they can become successful or millionaires. That is a lie and only ever suits the employer class who use it to get away with paying rubbish wages yet still get maximum effort. It also reinforces the belief that people get what they deserve in life, therefore poor folk deserve it and they aren’t getting any of my hard earned tax money. A convenient belief that legitimises the natural spite and greed of the average Tory voter. The problem that hamstrings Labour here is these would-be millionaires in waiting think ‘when’ they get all this money, Labour will tax hem to death. Blair convinced these suckers he wouldn’t do so but the real trick will be to explain the truth, that is the chances of you becoming rich through hard work are ultra slim so don’t worry abut taxes you’ll never be liable to pay… That said, these voters will still think the very rich are somehow special and shouldn’t be taxed because they worship at the alter f the rich. “Miliband isn’t very inspiring and doesn’t appear to believe in anything”? It seems you’ve been paying too much attention to the Tory media. Both Oborne and Prof W-L say the exact opposite, and I agree with them. Where have you been looking? I find it hard to take this seriously. “It seems you’ve been paying too much attention to the Tory media”? So if I disagree with you, I’m an ignoramus, sucked in by the media? May I suggest, politely, that you change the record? The media are appalling and are to blame for much that is wrong in Britain but I do actually have the capability of searching out other news sources and making up my mind from there. No Sun reader, I, sir. Oborne and the prof can say whatever they like but maybe I worded it badly; Miliband believes in lots of things, they’re just very dull, uncontroversial (to normal people), largely socially useless, occasionally socially backwards (why else have Rachel stop-the-dole-after-ywo-years Reeves in the shadow cabinet? ), willfully unambitious and terrified of the press. He has no strength, if he had he wouldn’t let the Conservatives consistently set the tone and he wouldn’t tailor his public statements for acceptability to the press, something his cabinet seem to copy. He tumbles upon a few uncontroversial policies that pretty much everyone but Herman Goering could agree with and that’s it. You might say ‘well the press are scared of him’. Well, yes, but the press isn’t the public, the press is owned by rich, right wing bastards who will do anything to avoid paying a bit more tax and will present Miliband in such a way as to try and scare people. In reality, what Miliband has to say is exceedingly bland and wouldn’t scare 85% of the population and it’s only a very small tax rise that would bother the other 15%. Politically, he’s a dull, weak man whose imagination, talent and paltry convictions are far outweighed by his ambition for power. May I suggest, politely, that you open your eyes and ears? Either you are intentionally ignoring the major achievements Miliband has secured, together with the important announcements he has made about Labour’s plans, or you have missed them. Neither alternative puts you in a clever position. “Ed Miliband has promised to remove privatisation from the NHS” I very much doubt he will be able to keep that promise. He may be able to slam the brakes on the process. The amount of money required to take back the NHS would be colossal. The potential PFI debt legacy’s are in excess of £300Bn. Unless he’s ready to tear up the PFI contracts and say sorry but you get nothing. Many PFI contracts don’t expire until well after the end of the next parliament. He might get some of it back, it will take at least 10 years if not longer to undo the damage of the last 20 years. Not that I’m saying we shouldn’t try. Sorry to say though the level of political and economic illiteracy in this country is appalling. Most people have no idea what their voting for or against they just vote on single issues and are often misguided. Politicians are now judged by media, how photogenic they are and the latest Tweet or TV soundbite. Well, repealing the Health and Social Care Act and ending the contracts it spawned will be a start. The PFI contracts can be paid off. It will be a long and painstaking process, unfortunately, but Labour was left with a fait accompli in 1997 – use PFI or let the NHS fall apart. PFI was used and by 2011 (while the NHS was still being run along Labour-predicated lines) public satisfaction with the NHS was at its highest ever. Some contracts have already been paid off, so it can be done. Q, Why do people still believe the Conservatives are more likely to raise their living standards than Labour, even though they understand that they have become worse off over the last five years? passion or anger been shown across the house. That is what the public need to see. Most people don’t read Hansard or study TheyWorkForYou. His policies are seeping out now, a few weeks before the election, but it is too little too late. Opposition needs to be shown throughout a parliament, not just before general elections. Too many debates, on what should have been the real issues of the day, have been carried out in a near-empty chamber. This is why the Tories are surviving with their near-genocidal policies. I’ve heard this rubbish about “Labour hasn’t shown any opposition” too many times before. It comes from people who haven’t been paying attention to what’s actually been going on – and from people with an anti-Labour agenda. You know perfectly well that Labour has mounted a strong opposition to the Tory-led Coalition, but because the Tories and Liberal Democrats have superiority of numbers, it is impossible for Labour to win in a whipped vote. The fact that Ed Miliband has won votes – from the Opposition benches – shows how strong a leader he actually is; he has persuaded members of the government to vote with him, against their own ministers.